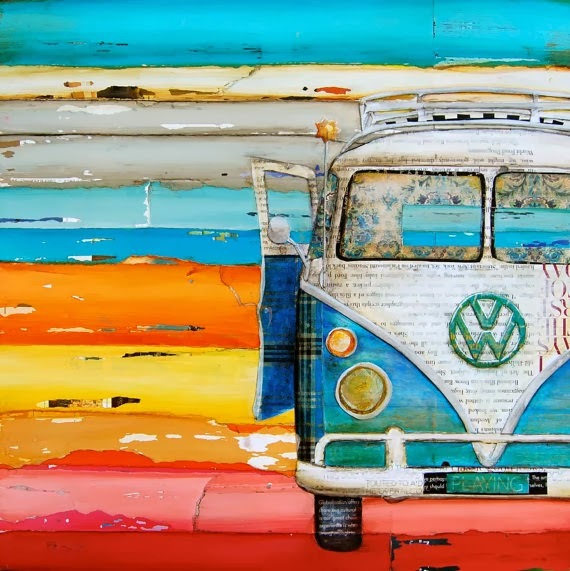 Mixed Media that's Simply Bold, Beachy, Nostalgic and Retro. An Artsy Invite to Take a Trip to the Coast or a Trip Back in Time. 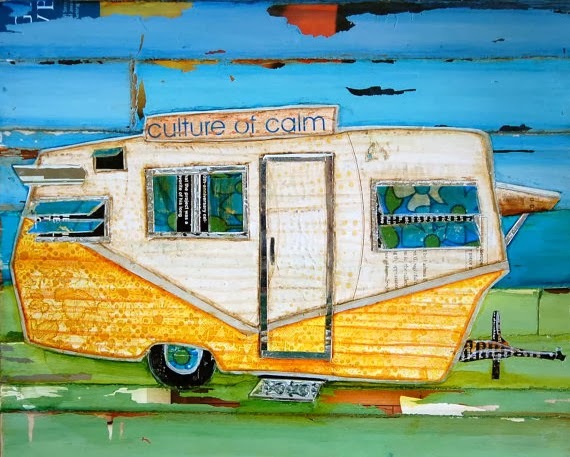 For Danny Phillips, creating Art is all about representing life in fun and colorful scenes to remind his viewers of simpler times and days at the coast. His pieces featuring WV bugs and vans and other goods from days gone by, like record players, Polaroids and All Stars, are successful in capturing a sense of nostalgia, reminiscent of a 60's / 70's era beachy vibe. Good times. 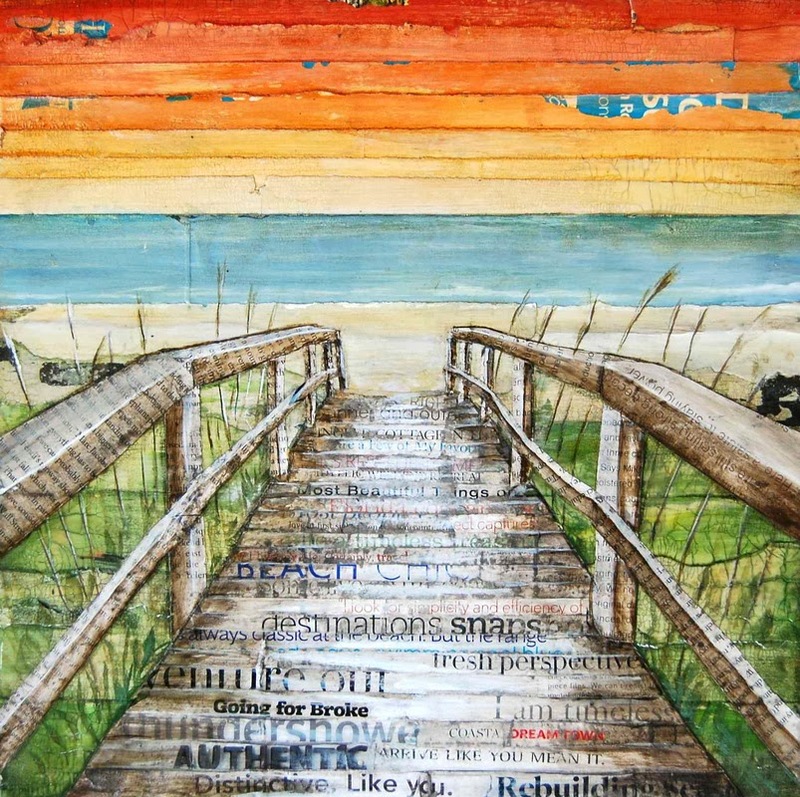 By collaging recycled magazines and newspaper, he is making creative use of materials that are otherwise wasted or forgotten. He then applies paint for color and a weathered look to contribute to the vintage feel. It is no wonder this artist has found a home in Austin, TX with his dedication to Upcycling. He even benefits from letting a few words from the first use of these papers show through to add an extra level of meaning. Art doesn't have to serious or "deep" to carry significant messages. That's one thing I love about Danny's work. He does a great job of bringing brightness to a room with both color choice and subject matter (and sometimes inspirational words). Plus, his unique, characteristic style is well executed across all of his work. They look similar, but up close, you can tell that no one is exactly the same, the mark of a practiced artist with a technique they own and enjoy! As someone who tends to take life too seriously, Danny’s work is a great reminder for me to treasure the color and happiness in each day.